We were fortunate to meet with Amanda Myers,BA, BEd - Community Enhancement Coordinator at Indigenous Services at Western University. We wanted to hear and learn about this valuable service for the students at Western. Ensuring indigenous students have a space to feel welcomed during their time as a student at this campus, is something of great importance at Indigenous Services. Without any further explanation, we will allow Amanda to share her vision and passion about her work here. Thank you Amanda for taking the time to meet with us and answer our questions. When did Indigenous Services come about at Western University? And how has it evolved since the beginning? Indigenous student supports are fairly recent to the university campus, the need became clear in the 1990’s and Western created a designated support in 1995 with one part-time staff role with in the Equity Services unit. In the early 2000’s we then moved to our own space with several designated computers, a small kitchenette and two offices for two full time staff. In about 2008 a new building was completed with a much more suitable space for us, this is the space where we currently reside in the Western Student Support Building, Room 2100. This space has seven offices, a full kitchen, computer lab, social space and quiet study space and in those short ten years we are now again busting at the seams. This is evidence that when Indigenous peoples feel safe and welcome our numbers will steadily increase. Tell us about yourself and your role here. My Anishinaabe name is Kitaay bizhikikwe, of the marten clan. I am of mixed blood, Anishinaabe, Pottawatomi and Metis, mother to one daughter and auntie to many nieces and nephews. I do not have a home community, I often refer to my home as Moningwaanakaaning or Madeline Island, Wisconsin because that is where my family is originally connected and where I have found my home in the Midewiwin Three Fires Lodge. I completed a BA and BEd here at Western before beginning my work with Indigenous Services in 2013. I now hold the role of Community Enhancement Coordinator, in this role I foster relationships between Western and Indigenous communities, I liaise with Western staff, faculty and students, I help to create pathways and experiences for Indigenous youth to post secondary education, I am a relationship builder. How do students access your services? 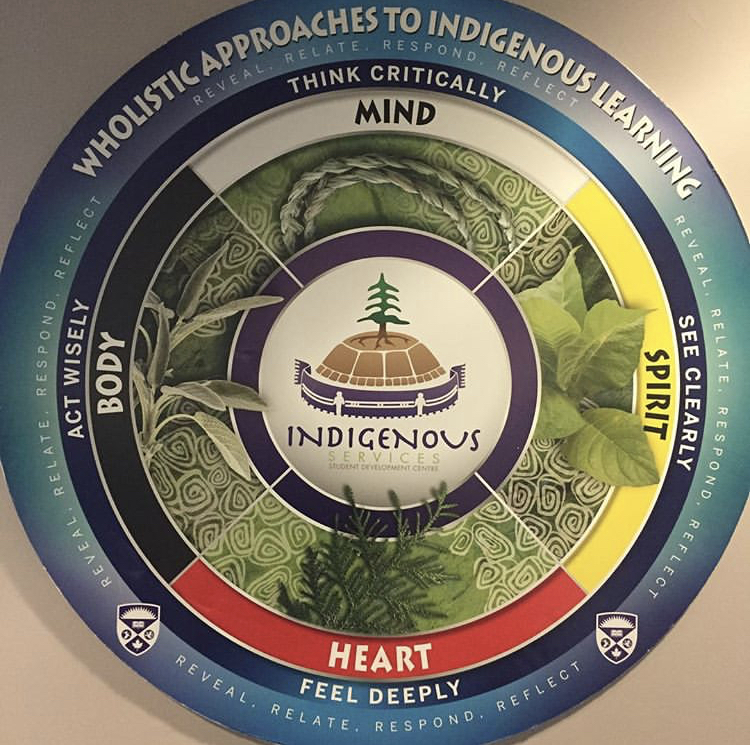 We do our best to connect with incoming students personally so that they know about our centre and the supports that we offer, however if they choose not to self identify as Indigenous it can be difficult. There are still many reasons, personal, cultural and political that influence a person’s decision to self identify as Indigenous. What are the Elder’s roles at Indigenous Services? We have three visiting Elders this year, each bringing different gifts. They primarily provide culturally founded personal support to our students, as well as support and advisory consultation to our staff and faculty both Indigenous and non-Indigenous. They meet one on one with our students and support campus wide initiatives through advisory consultation work with in various spaces such as committee work etc. Is there a story that would be relevant to the student experience. I feel very fortunate to have now been in my role long enough that I can see new first year faces each year that have gone through our youth programming. We know that our people need access to culturally founded safe spaces, so for our team to have to opportunity to provide these spaces and experiences for our youth is a very rewarding experience. Then to see them attain their goals of accessing post-secondary education is literally the best feeling of my career. What are the summer programs offered and can you tell us about them? Each spring we facilitate an Indigenous Track and Field Event for youth in grades 7 & 8. This is an opportunity for local youth to visit and learn about campus, connect with Indigenous University students and varsity athletes. Visiting the campus for the day can be a really impactful experience for our youth and their chaperones. During the summer we host the Mini-University program for Indigenous youth ages 12-17. Youth come to stay on campus for 5 days/nights to gain first hand experience of the life of a first year student living in residence. The program facilitated by a team of 5 Indigenous Western University students how ensure that there is a strong cultural foundation as well as authentic academic experiences. In the fall during our Indigenous Awareness Week we host a student panel so that Indigenous youth can visit and learn about campus, hear the first hand accounts of university life from our students and get pointers from our staff on applications, funding, housing etc. Is there anything else you would like to tell us about this program? The work that we do here through Indigenous Services not only increases the current Indigenous student population, improves their experiences and promote their cultural well being, it also has a very strong impact on our local community members, as well our students, staff and faculty campus wide. I am proud to work here we create resilience and healing for our people. Thank you so much to Amanda for taking the time to meet with us and share with us her experiences and hopes for the future. We really appreciate it!